A small hydraulic press for KBr pellets. The Specac Mini-Pellet Press is an entry-level, handheld laboratory hydraulic press for the preparation of high-quality 7 mm KBr pellets for transmission FTIR analysis. With a rugged and durable design, this mini hydraulic press is intended for regular laboratory use with maintenance-free operation. Key Applications: Mining & Minerals, Metallurgical, Environmental, Petrochemical, Radioactive Materials Research, Academic Research. 35-ton (31.8 metric ton) hydraulic laboratory pellet press that accepts 13 mm, 31 mm, 35 mm, and 40 mm pellet die sets. Automatic and fully programmable. 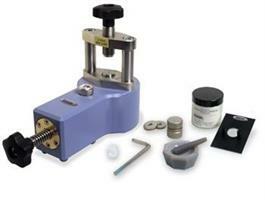 Ideal for repetitive pressing of sample pellets for XRF, IR, and other analytical techniques.CE Approved.